These bendable wall mirrors are shatter resistant and have smooth edges. Mirrors build self awareness and develop curiosity. All flat mirrors are made of special formation bendable shatter resistant PET. Mirrors can be installed on many different surfaces. Mounting hardware is not included. Bubble Mirrors create interesting visual perspectives in a variety of sizes. 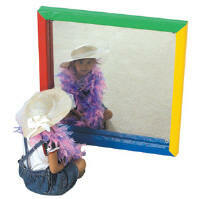 Themed play mirrors made of shatterproof acrylic. Wall Panel Activities include maze panels, gear panels and many more panels that expand thought and small motor skills, providing hours of entertainment. The units offer play value while taking up only wall space and no loose pieces to get lost or stepped on. Learning Walls do so many things. Not only do they hold children's interest, they promote the development of fine motor skills and offer optical, sensory ad acoustical experiences. Even better, no small parts can get lost, meaning absolutely no clean up. Just arrange the panels how you like and watch the fun begin. Wall Elements are our newest addition to the Wall Panel activity products line. These decorative, eye-catching units can be combined for a complete theme or used in any area to add a colorful component. The tree, meadow activities and windmill encourage small motor skills. Sensory Wall Panels - Three mounting options and a multitude of panel options make the new Sensory Wall Panel System a sensation for the eyes, fingers and ears. Combine the panels in a wall mounted display of one or two rows or simply mount the panels directly to the wall. The variety of elements allows for many different sensory experiences. 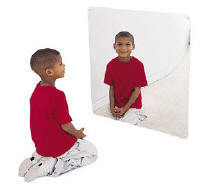 Place our PET mirrors in any corner to enhance self-image, discovery, and visual perception. Attach with our injection molded polyethylene mirror corners and side safes. 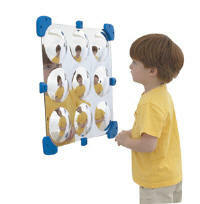 Simplifies installation and holds mirrors fast against surface. Hardware not included. 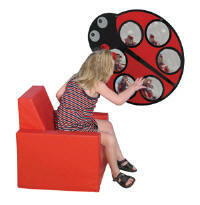 Our ladybug mirror attracts and amazes children as their reflections multiply in the six bubble mirror. Design silk screened on back of mirror so color will not scratch off. Hardware not included. 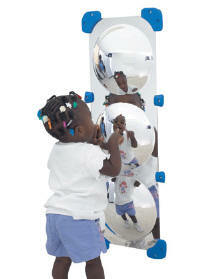 23"L x 23"W - This Mirror is designed to go with the New Lily Pad Lane Play Center. CF332-134 MEASURE ME MIRROR 32"
24" diameter mirror conceptually blossoms on its 15"h Wall Design green stem. Hardware not included. All ages. Friendly T-Rex Mirror and Beguiling Bronto Mirror. Hardware not included. Three animated ocean creatures will turn your wall into a mini aquarium with our shatter-resistant PET mirrors. Hardware not included. Sizes vary - see below for individual sizes. Let our sea creatures transport your little ones into a world of visual perception. These shatter resistant acrylic mirrors enhance self-image, discovery, and visual perception. Keeps children mesmerized while promoting creative exploration. Hardware not included. 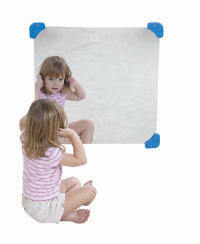 Simple shatterproof acrylic mirrors can be hand held or secured to the wall. 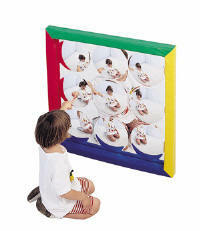 Helps early learning children develop awareness of themselves and their surroundings. 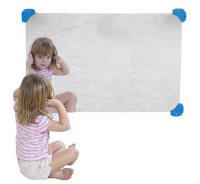 Constructed in safe, shatter-proof acrylic that can be mounted on a wall (mounting hardware not included) or the floor. 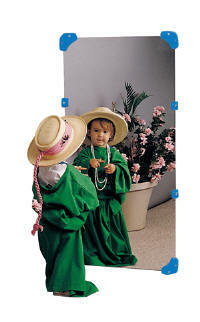 Dimensions of each mirror: .125"L x 16"W x 14"H. GreenGuard Certified. Made in USA. Lifetime warranty. 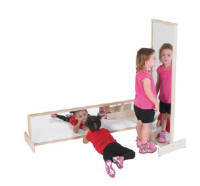 Small - 10", Medium 15", Large 19 3/4"
Mirrors help children develop a concept of themselves and others. They consciously start looking at mirrors about age 1. 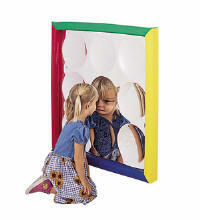 The unique HABA mirrors are extremely appealing for children. Their lovingly designed frames invite children to play and explore. Their bright colors and shapes inspire younger children to look at themselves in the mirror and discover their reflection. This mirror design is just right for children. It adorns any wall so that as a decoration these shatterproof mirrors create a comfortable atmosphere. Hardware included. Made in Germany - Allow 12-14 weeks. 10 year Manufacturer warranty. 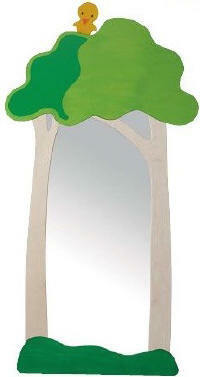 Tree Mirror by HABA. Birch wood with safety mirror (�", 5 mm thick). W 39� x H 76 �� x D 1 ��, W 99 x H 195 x D 3 cm. 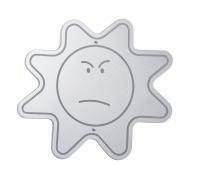 Sun/Ocean Mirror by HABA. Birch wood with safety mirror (�", 5 mm thick). W 34 �" x H 73 �" x D 1 �", W 87.6 x H 187 x D 3.2 cm. 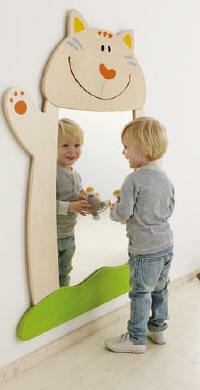 Cat Mirror by HABA. Birch wood with safety mirror (�", 5 mm thick). W 39" x H 48 �" x D 1 �", W 99 x H 123 x D 3 cm. 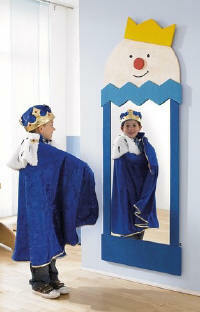 King Mirror - A fairy tale is what awaits children when they look at this king. 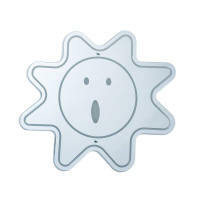 Hang up or place on a cabinet or bolt to a wall. Frames made of genuine birch, safety mirror. W 23 �� x H 64�, W 60 x H 162 cm. 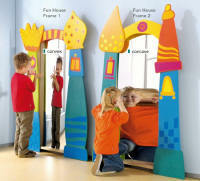 Fun-house Frame 1 and 2 !The colorful towers give mirror games a bright, cheery framework. Birch plywood, painted. Use with 697751, 697752. W 39 �� x H 61 �� x D 4�, W 110 x H 155.5 x D 10 cm. Mirrors and Frames sold separately. 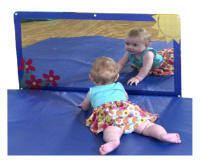 Mirrors help children develop a concept of themselves and others. They consciously start looking at mirrors about age 1. 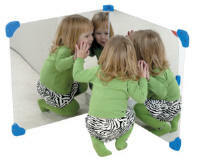 The unique HABA mirrors are extremely appealing for children. Their lovingly designed frames invite children to play and explore. Their bright colors and shapes inspire younger children to look at themselves in the mirror and discover their reflection. This mirror design is just right for children. It adorns any wall so that as a decoration these shatterproof mirrors create a comfortable atmosphere. Hardware included. Made in Germany - Allow 12-14 weeks. 10 year Manufacturer warranty. All Products are UPS Shippable.